This is the title of a talk I'm giving this Sunday, 29th May at the Corn Exchange, Market Square, Melrose, TD6 9PN. Map. 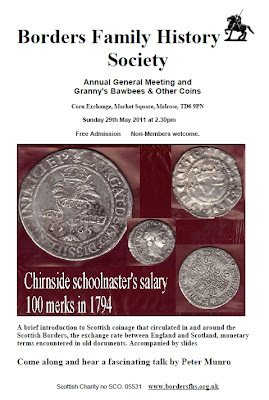 It's a brief introduction to Scottish coinage, and other coins, and tokens that circulated in and around the Scottish Borders, the exchange rate between England and Scotland, monetary terms encountered in old documents. Accompanied by slides with pictures of coins, tokens, a banknote and other items. 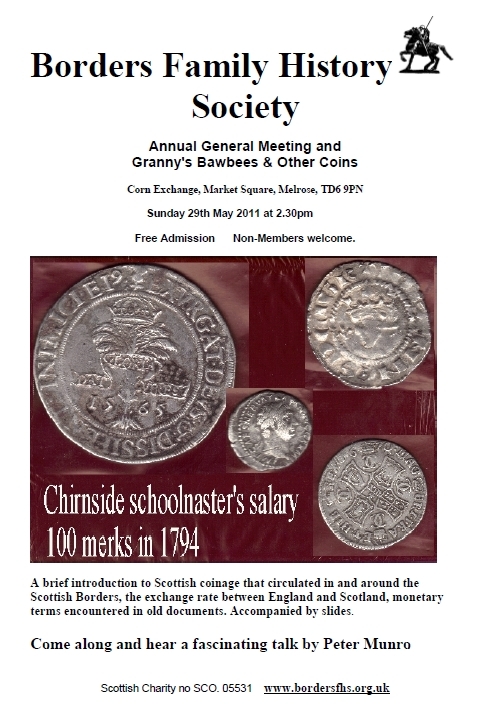 If you want help in identifying a coin, please bring it along, and talk to me after I've finished speaking. Doors open at 2pm. The talk will be preceded by our Annual General Meeting, which starts at 2.30pm. The talk starts after the annual general meeting has finished, probably around 3pm. We warmly invite you to attend the annual general meeting and the talk whether you are a member or not. There is no admission charge. As usual, there will be light refreshments available after the talk.